UC ANR Cooperative Extension advisers teach about the latest advancements in animal care and breeding techniques to improve herd wellness and productivity. 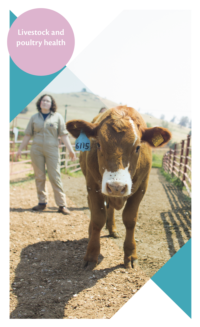 Feeding adjustments improve dairy herd health: UC ANR Cooperative Extension dairy specialists present periodic free seminars in English and Spanish for dairy managers and California dairy farm employees on feed preparation and delivery. Participants learn the latest science-based techniques to improve the health and production of dairy cattle by reducing variability in feed rations though proper dry matter measurement and consistent recipe mixes and by maintaining a feeding schedule. GE foods do not affect livestock: Food-producing animals that consume genetically engineered feed are as healthy and productive as animals consuming non-GE feed, according to a study by UC scientists. Further, the researchers detected no differences in the nutritional makeup of the meat, milk or other food products derived from animals that ate genetically engineered feed. Since 1996, when genetically engineered crops were introduced, 19 GE plant species have been approved for use in the United States, including alfalfa, canola, corn, cotton, soybean and sugar beet crops, which are used extensively in animal feed.